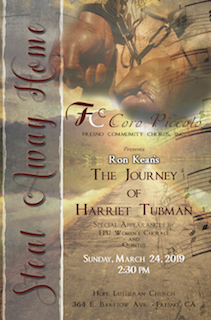 Coro Piccolo, conducted by Dr. Anna Hamre, presents Ron Kean's The Journey of Harriet Tubman. Teresa Gipson is the featured soloist. Coro Piccolo is the chamber ensemble of Fresno Community Chorus, Inc. This concert also includes special appearances by Fresno Pacific University Women's Chorale, conducted by Dr. Bethany Lynn Alvey and by Quintus of Fresno Community Chorus, Inc.
Pre-concert talk by composer at 1:30pm.